This classic Italian dessert — shared with me years ago by a pastry chef who worked at Seattle's La Spiga restaurant — is like a richer, smoother version of Jell-O pudding. 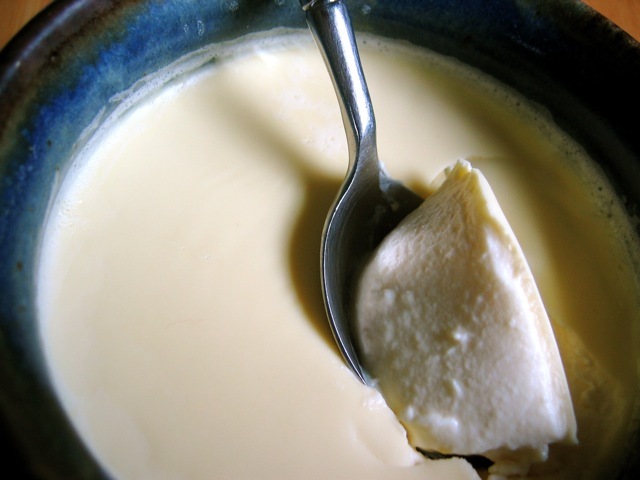 Cook the cream: In a heavy saucepan, stir together the cream, half-and-half, and sugar until the sugar is dissolved. Cook on medium to medium-high heat, stirring occasionally, until scalding (the mixture will start to rise rapidly). Turn off the heat and lift the pot to stop the scalding. Assemble the pudding: Put the cold water in a bowl and sprinkle the powdered gelatin into the water, allowing the gelatin to dissolve completely. Add a large spoonful of the cooked cream and stir steadily until the mixture is smooth and the gelatin completely dissolved. Add the gelatin mixture back into the pot of cooked cream and whisk out any remaining lumps. Add the vanilla. For a flan-style panna cotta, make caramel sauce: In a heavy saucepan over high heat, cook the ½ cup sugar and ⅛ cup hot water until it starts to brown. (Be careful not to burn the caramel sauce.) Do not stir the sauce while cooking. Pour the hot caramel sauce into a large ceramic serving dish or several ceramic ramekins, then top with the warm cooked cream. Refrigerate for at least 3 hours, covered with plastic wrap. Invert the dishes to serve. For a plain panna cotta: Pour the warm cooked cream into a single large ceramic serving dish or several ramekins and chill for at least 3 hours. Serve this panna cotta as is, or melt some berries and sugar into a thick sauce in a saucepan and serve over the panna cotta.